Hope you all have had a great holiday season and hopefully you'll all have a fantastic end to '07 and a great beginning to '08. Anyways, there isn't really any new news about anything Twins related, except that we've learned what the new add campaign for the twins will be 'Just who are these guys?' The old add campaign of "Get To Know 'Em" was created to get fans familiarized with some of the new players that had gone through the Twins' system. That is not necessarily the case with this one as most of the new players are from other organizations acquired either via trade or free agency. That list includes Delmon Young, Brendan Harris and Jason Pridie who were all acquired in the trade with the Tampa Bay Rays back in November. It also includes two former Houston Astros infielders Mike Lamb and Adam Everett who were both signed as free agents in December. That list may also include a few new players if the Twins decide to trade their start southpaw pitcher Johan Santana. "We have one big issue to deal with," Smith said. "Maybe if we get that taken care of, we'll answer the other questions." The "big issue" is obviously the fate of Johan Santana. The other questions being the pitching rotation and center field. Ellsbury's name has been thrown around the trade rumors a lot. He's definitely a player the Twins are very high on, and rightfully so, he's a good, young outfielder. He does not posses much power, but he's an ideal leadoff hitter and he also brings great defense at a premium position. His base stealing skills would come in big handy as the Twins no longer have two of their '07 steals leaders in Torii Hunter and Jason Bartlett. The rest of this package is the reason why the Twins have not pulled off a deal involving him. The Twins want the Red Sox to include pitcher Jon Lester along with Ellsbury in the same deal, however the Red Sox have been reluctant to do so, which raises the question; Are they serious about trading for Johan Santana, or are they just in it to drive up the price for the Yankees? He is a great player, however he reminds me a lot of former Red Sox hero Johnny Damon who also was a good leadoff hitter with great speed and limited power. He also reminds me of Kenny Lofton, which would also not be bad. "The Royal Rooters" has a great read on what Jacoby Ellsbury, definitely check it out. "I like Melky Cabrera for what he is. I think he's a good fourth outfielder, a very good fifth outfielder. I don't see him as an everyday player. Now on the Yankees he can be, because with their offense you can kind of work around him a little bit, but I don't see him as an everyday player on most other teams. He's a role player...Yeah, Melky Cabrera to me is not a reason to not go to the playoffs...I would have explored every possibility of finding a defensive guy to play center field if Melky Cabrera was the sticking point. To me, I don't let Melky Cabrera keep me out of the playoffs if I can bring Eric Gagne in." Sorry Steve, but Melky Cabrera is not a "good fourth outfielder" or "a very good fifth outfielder." And why would a team need to find a "defensive guy to play center field if Melky Cabrera was the sticking point"? That makes no sense as he' lead all center fielders with 14 outfield assists and was 6th in zone rating. (For those who qualified) His fielding percentage was 12th in the league which was above some very good defensive players such as Carlos Beltran, Mike Cameron, Juan Pierre and Gary Mathews Jr. Good argument, Steve. Jones is one of my favorite young players in baseball. Reason being is that he reminds me a bit of former Twin Torii Hunter. His body type and aggressiveness are definitely big comparisons. He probably projects to be a better contact hitter than Hunter, but I can see Jones have great defense as Hunter once did and his power potential is right around 30, which is also close to Hunter's. Jones' name has probably come up the least out of the guys on this list, but I think he definitely possesses great potential to be a middle-of-the-lineup batter and although his defense is probably closer to average than great, right now, but he has good enough speed and his instincts are good enough to put him as a potential gold glover. I like Jones a lot, however I think acquiring him would probably be less likely than acquiring any other player on this list, just because the Mariners haven't been mentioned as much as the others. Gomez might have the most potential on this list of players, but he also is the most "raw" player and has very little experience compared to the others as well. He has a great body frame of 6 feet, 4 inches and 195 lbs. He also is considered one of the fastest players in baseball, and has been said to have more speed than teammate Jose Reyes. The Mets are starting to emerge as a possible favorite to land Santana, the question is "what will they give up for him?" According to Jayson Stark, the Twins proposed an offer of outfielders Carlos Gomez and Fernando Marinez as well as pitchers Kevin Mulvey, Mike Pelfrey, and Phil Humber. The Mets reportedly countered with Gomez, two of the pitchers mentioned, and another unnamed prospect. In my opinion, asking for all five of those players is very unreasonable on the Twins behalf and I don't think it'll ever happen. Now, if the unnamed prospect in the counter offer by the Mets happened to be Martinez (which I admit, is doubtful) then I think the Twins would be foolish to not make that trade. But I think a more realistic trade that would be pretty fair for both teams would be outfielders Gomez and Brahiam Maldando along with pitchers Pelfrey, Deolis Guerra, and Mulvey. The Twins are very unlikely to get Martinez as he's one of the highest rated outfield prospects in baseball as well as Carlos Gomez, especially after the team also just traded Lastings Milledge who was also one of their young outfielders that they were going to rely on in the future. If you're interested in reading more on some of the Mets prospects being talked about in the trade talks, head on over to SethSpeaks and he lets you "Get To Know 'Em" Mets-style. • Seth Stohs did a great "Where Are We Now" post and it explained the current state of the Twins with an accurate depth chart. Definitely check that out. • Kelly Theiser got to do a good Q&A with Glen Perkins. She also gives a good recap for the last year for the Twins. • Earlier this week, Pat Neshek continued with part 3 of his "Getting drafted" series on his blog. It's a really good read and gives fans some insight to what goes on during the drafting process. I've also added a blog roll of different blogs (not just Twins blogs) right hand side of the page. If you'd like to exchange links, just let me know and give me your URL. Sorry I don't have more to offer today, just nothing really that I can dwell on. Not sure how posting will be this weekend, but I might get something up before the New Year if anything new comes up. But if I don't, take care and have a great New Year. Good morning. Yesterday, I touched up on the reports that the Twins were reportedly decreasing their demands from the Yankees and won't require Ian Kennedy to be apart any Johan Santana trade. That specific rumor never really picked up steam, but there was something else that was interesting to note. Last night, La Velle E. Neal III posted on his blog that the Twins "checked in" with the Red Sox, Yankees and the Mets before the Holiday Break. Nothing really new in the report, besides the fact that the Mets remain in the picture. Most of the earlier reports have been that the Mets would have to include young shortstop Jose Reyes in any deal involving Santana, but that doesn't seem to be the case any more. It's unknown who the Twins are seriously interested from the Mets, except reports have mentioned outfielders Carlos Gomez and Fernando Martinez, as well as Mike Pelfrey, Phil Humber and Kevin Mulvey. I'm not very high on all those guys, but they do have a decent amount of potential. The Mets probably would be reluctant to part with both Martinez and Gomez, and I'm not sure if the Twins would really need to acquire both. One of them will be the center fielder of the future, and the other would have to fight to find a spot to play. Although the Twins shouldn't be shy when it comes to acquiring high-potential bats as our biggest weakness is offense. The other hard part is that neither are really ready for every day jobs yet, but the Twins may move them quickly to fill their void in center field. I personally can't decide which one I'd choose, but I do know that the Mets need to part with 4-5 players total to get a deal done. Pelfrey, Gomez or Martinez, Mulvey, Deolis Guerra would be a respectable return for Santana. LEN3 also states that the talks between the Red Sox and Twins are 'dormant'. That's interesting as Boston's designated hitter David Ortiz said Sunday that he doesn't think the Red Sox will land Santana. "No," Big Papi told the Boston Herald when asked if he thought Sanatana was Boston-bound. "I was (following it) for a minute, but I guess they stopped. They don't want him to go. (Minnesota) already gave Boston too many good things already. So the reports last week from the Pioneer Press that a deal was supposedly "imminent" and that the Red Sox were the favorites look to have been false. The Twins would like to get a deal done with Jon Lester and Jacoby Ellsbury, but the Twins may have to lower their demands in that offer as well if they want to get a deal done. But if they don't, and feel they can get both sooner or later (which could happen), then they have every right to hold out for both of them to be included before a deal. La Velle also said something that I was talking about yesterday, and that was the possibility of adding Kei Igawa to the deal. He said his name has been in talks involving the Yankees and Twins. This makes sense as the Yankees would like to shed some salary as they acquire Santana. Again, nothing really new (unfortunately), but hopefully we're moving closer to an answer to where Santana will be in 2008. Mid-day update: Twins lowering return demands for Santana? According to the New York Times, the Twins are no longer demanding pitcher Ian Kennedy in a trade for Johan Santana that would likely involve center fielder Melky Cabrera and pitcher Phil Hughes. Insead, the report states that the Twins will probably go back to the offer that the Yankees (reportedly) offered at the Winter Meetings that would include both Cabrera and Hughes, along with another pitcher named Jeff Marquez. It's unsure if a player would also be involved as the first (rumored) offer also involved shortstop/third baseman Mitch Hilligoss as well. This is not a bad deal by any means, so Twins fans should not be alarmed by this. Honestly, I new the Twins would likely be the team to lower their demand as I thought that the Yankees including Kennedy along with Hughes (with no other players) was still a bit of a stretch. Readers know that I'm very high on Phil Hughes and I also am fond of Melky Cabrera as well. I'm not that high on Marquez, but he is a fairly good, young pitcher who could be ready to taste his first experience in the Big Leagues sometime later this season. Both Hughes & Cabrera would likely start the season in the starting rotation/lineup. I'm not sure about the Twins demanding another player besides Marquez. I think Hillgoss would be a good addition, although I think the Yankees may try to "pawn" off a high-salary player such as Hideki Matsui or Kei Igawa on us instead. Now, I doubt they'd just add Matsui if Marquez was already involved, and I'm not even sure what the Twins would plan on doing with him, but it is a known fact that the Yankees would like to shed some salary before or as they acquire Santana. However, another bit of speculation on my part. If the Twins really are lowering their demand, they should ask for Edwar Ramirez who would be a great addition to our bullpen if we wanted to later explore a deal with Joe Nathan. In 268.1 innings pitched in the minors, Ramirez has a great 12.19 K/9 ratio. He also has a respectable 2.85 BB/9 ratio to go along with his 2.45 ERA. He pitched a little for the Yankees in '07, but had an 8.14 ERA in 21.1 innings pitched. He did however manage to strike out 31 batters as he struggled. This is a very interesting development and it's making me a little excited about the prospect of bringing in Hughes, who I think would be a very good replacement for Santana. Stay tuned, nothing "officially" can happen until after the New Year as the Major League offices are closed through the holidays, but we may be getting closer to a potential deal. Another thing is we all need to take these things with a grain of salt as it seems like every day a new scenario is arising in these trade talks. But this does make a little sense. Hello. Last time I posted, I took an early look at the Twins rotation for the 2008 season. I explained that it's still very unknown whether the Twins will trade or keep Johan Santana. I listed a new option I'd feel comfortable with in return for Santana, which would involve the Yankees parting with Phil Hughes and Ian Kennedy for the two-time Cy Young award winner. Right now, it looks very unlikely for a deal like that to take place, at least anytime in the near future as reports are now swirling that the Yankees are now out of the running. Of course, we have to take that with a grain of salt as it is the Yankees, and it's not like they've never went back on their word. I've began to think that with the way Bill Smith has stood his ground, given the fact that he's a first-year GM, that there may be something that nobody is thinking about right now. And that's that the Twins could feel that they may still have a chance of re-signing Santana and they just want to see what the market is for him. If that's the case, perhaps Smith has the word from Carl Pohlad that if we can't trade him, that a deal is not out of the question. Of course, I wanted to think that was the same with Torii Hunter earlier this off-season. But if the Twins keep Santana, what are the advantages of not trading him? Disadvantages? I'll give 3 of both, but feel free to discuss any others that I don't mention. 1. It's a good PR move. The Twins just lost the most marketable player on the team in Torii Hunter and really, with respect to Joe Mauer, Johan Santana is by far our next most marketable player on the team. Can you imagine the public out roar if the Twins lose both Johan Santana and Torii Hunter in the same off-season, even if they're receiving several nice young players in return? It could be a very bad move as the team is set to open the new stadium in just 2 years. The last thing the team wants to do is to lose any part of its fan base before the biggest revenue-earning period in team history. 2. If the Twins don't work out a deal right now, there's always the possibility of working out something later as his current value isn't as good as it should be. Many people look at last seasons "drop off" as a warning sign of a possible decline as he could've been overworked the last few years. I'm not buying it, and I think that he'll have a fine 2008 season and the Twins could maximize his value by keeping him until the July trade deadline and swapping him for a larger package at that point. Though, this move comes with a couple risks of its own. First, what if Santana doesn't "bounce back" and he starts off the season on a bad foot. It could happen. You have to imagine the things he's thinking about right now, as he's unsure of where he'll be playing in less than 100 days (opening day!!!). The teams may also be unwilling to part with any young substantial players as they'd only be getting Santana for a couple months before he'd hit free agency, when they they'd have to pay him somewhere between $20-25 million per season. But then again, a team could see Santana as their last-remaining piece (which I'm sure plenty already do) and could offer their farm system for him and try to win this season and probably be favorites for the next 2-3 years. 3. Our pitching staff will benefit with him at the top, without a doubt. The return of Francisco Liriano has left the team in a little bit of a pickle. Nobody knows what is going to happen with Liriano's future. He could rebound and have a very good, successful season, despite having Tommy John Surgery. He could also flounder and lose face and never return to anything. It's definitely a risky move, and if the team really is looking at the future, having a healthy and effective Liriano at the top of the rotation is going to be a key part to their success for years to come. The team also has a few other unknowns in the rotation with the question of how will Boof Bonser respond to his "new physic" and if he really was just lacking his "second wind" or if it was something else and it just shows that he's not fit to be a starting pitcher in the major leagues. Scott Baker had a good season with the Twins, although he also did in 2005 and in '06, he looked awful. Many want to pencil him in as a sure-thing for next year to be a reliable starter, but to me, he's got some big questions to answer. Kevin Slowey is probably ready to start next year, although he's very inexperienced and will probably have his ups and his downs. Nick Blackburn, Brian Duensing, Brian Bass, and Glen Perkins are also inexperienced (with only Perkins & Blackburn having any sort of experience at all) and it's not really fair to expect them to start every 5th day. 1. It really doesn't look like the smartest move to pay 1 player, regardless of how good they are, upwards of $20+ million per season, which will likely equate to 1/4 of our entire teams payroll. It's financially irresponsible on the organizations behalf. The team can find fill multiple positions, upgrading what we already have (such as center field, third base, and designated hitter), and we'd be getting probably more contribution to our teams success by doing so. Meaning, it's possible we could win more games by splitting the cost between multiple holes that we have. 2. His "down" year, (which again, I don't buy), may actually be a sign of what's to come. It could just be the beginning of a possible sharp decline in production from his part and it'd be a risky move paying a player, that amount of money while he doesn't earn it. And really, I don't think right now that the money is really what is the issue for the Twins, it's the fact that they aren't comfortable paying a player over a long-term deal. I can see them being fine with paying him even $25 million per season over the next 4-years, but Santana wants a long-term deal somewhere between 5-7 years. And I don't see that changing. 3. The team won't be acquiring any young talent that they can control at a very low price for the next 4-5 years while they progress into young potentially great players. The rumored offers of Jacoby Ellsbury from the Red Sox & Phil Hughes from the Yankees would give the team a very good young player in return in which they'd be able to control them for the next 4-5 years at a very reasonable price. The team could be getting a great young player who could be a potential All-Star and still at the same time add a couple good players with the money they save. Really. It's very unknown what the Twins will do. Every day it seems like a different story. But for now, nothing looks like it will get done within the next week or two as Major League Baseballs offices are closed from this last Friday through the New Year. So anything that happens, can not be made official for the next week and a half or so. What other advantages and disadvantages are there that I did not mention? Feel free to discuss them, and I'll probably pop in with some feedback of my own when I get a chance. And with that, I want to wish everyone a Happy Holidays. I'm not sure how much posting I'll be doing over the next week or so, so until next time. Have a great day. On Thursday, Carlos Silva officially signed a contract with the Seattle Mariners worth $48 million over 4 years. Check out my post from yesterday to see my thoughts and opinions on Seattle's addition of Silva. So with Silva gone to the Mariners, Matt Garza gone to the Rays, and the possibility of Johan Santana soon joining the trend of departure, what does the Twins rotation in '08 look like? Nothing is set-in-stone just yet. Talk this off-season makes it sound as if the Twins don't have any pitcher penciled in as a sure starter, and obviously that includes Santana with all the rumor's swirling around. So Spring Training will be a big time for the Twins pitching staff as what looks like a possibility of 8 or more pitchers will be competing for spots in the rotation. Right now, the Twins have not added a pitcher to compete in the rotation, but smart money says that they likely will bring in someone to give some "veteran leadership" with a potentially very young pitching staff. Kris Benson who missed all of the 2007 season recovering from a torn labrum was recently noted to be an interest of the Twins. He could also be a low-risk/high reward guy, except his overall career numbers show that he's been over hyped as he was the first overall pick of the 1997 draft. He likely wouldn't give the Twins a consistent inning-eater as he has not pitched in over a year, and I think that if they decide that they need someone to come in here to help mentor our youth, then he should be able to eat up a bunch of innings as he does it. Another option that would interest me is Freddy Garcia. He's a type-B free agent and is also coming off of an injury last season. He had surgery on his right shoulder which ended his season in June. He too is a potential low-risk/high reward, but again may not be the consistent inning-eater that the Twins should look for. Although his overall career numbers are pretty good. Other guys that interest me are Jason Jennings, Bartolo Colon, Josh Towers and Livan Hernandez. Colon was injured in '07, although was the AL Cy Young winner in '05 and has been a very good starting pitcher over the course of his career. Jennings isn't a consistent pitcher, although does have the "stuff" to make him a good pitcher. Towers has also had a very inconsistent career, although his "stuff" is there as well. And Hernandez is the definition of an inning eater and in my mind would be a good pitcher to sign for a one or two year deal, although he's probably going to be getting the most money out of all the players I've mentioned. I should mention though that with the exception of Benson, the Twins have not been linked to any of these pitchers and it's unlikely that they sign any of them. A more "Twins-like" signing would be Russ Ortiz. With that said, I don't really think the Twins necessarily need to add a starting pitcher via free agency. I can somewhat justify it if we trade Santana, except we'll likely be getting a good pitcher (or hopefully two) in return and again probably won't need to add a starter. Although, we probably will just because that's what the Twins have done in the past (Sidney Ponson and Ramon Ortiz in 2007). Here is a look at the current "in-house" options the Twins have to compete for the 5-man rotation. Johan Santana - I'm not going to comment on him as everyone knows about him already. If he's on the team, he'll start game 1 of the season and likely follow up a "sub-par" (to Santana's expectations) season with a solid year. Francisco Liriano - He's a guy the Twins wish they knew what they were getting in as he returns from Tommy John Surgery that he underwent last fall. If he was healthy, it'd make the Twins decision to trade Johan Santana a lot more easier as he's a potential ace, but his injury brings concern to the Twins front office of whether if he'll ever come back the same. All the reports of his progress through rehab have been very promising and Twins fans should feel optimistic about his return, but they shouldn't be naive as well. There are a lot of things working against Liriano in his return to greatness and they have to understand that it may take a year or two for him to regain his full form, if he ever does at all. Of course another thing to be optimistic about his return is the fact that his rubber ligament that he had implanted in his left elbow should allow him to pitcher pain-free and may even give him more velocity on his fastball which before his injury topped out at about 98 MPH. Kevin Slowey - Slowey has had a great career in the minor leagues posting a career 1.93 ERA in 354.1 innings. He also has compiled a very good 8.7 K/9 ratio, which is good considering he's considered more of a control pitcher. He struggled in the majors in 66+ innings this season, although he showed a lot of potential and I think the Twins have something special in Slowey. He's been compared to the likes of Greg Maddux for his great control and at the age of 23, that's a very high praise. I hope that he continues to progress as I see him being a potential top-of-the-order starter at some point in his career. Scott Baker - He's also a "probable" starter right now as the Twins got some great numbers from him in just 143.2 innings last season. He started out strong for the Twins, nearly pitching a complete game shutout in his first start of the season against the Milwaukee Brewers. After that, he hit a big road block after giving up 20 runs over his next 4 starts or 18.2 innings. He regained his true form in August (although had a few good streaks in between) and was great the rest of the season. 2008 will also probably be a make or break year for Baker as well and I am optimistic that he too will have a good season for the Twins, however I also think that if he fails again, he'll be gone by the trading deadline in July. Boof Bonser - He had a disappointing 2007 season after a promising '06 season. The Twins stuck with him for most of the season in the rotation, but after his demotion to the bullpen late in the season, the Twins management determined what may be the problem. The 6 foot 4, 260 pitcher may have lost his "second wind" during the 5th and 6th innings in which he was shelled by apposing batters. In fact, he started looking a lot like the David Wells, and that's not meant to be a good thing. The problem was his weight, and the Twins set up an off-season goal for him to lose 25 pounds. Well yesterday La Velle E. Neal III updated us with some very encouraging news from his workouts. With 6 weeks still left to go before the start of Spring Training, Bonser has already lost 20 pounds or 80% of the Twins overall goal. Hopefully he doesn't just stop at 25 pounds and continues to be a "workout warrior" as I think the better shape he's in, the better he'll pitch. The season could potentially be make or break year for the 26-year-old Bonser as the Twins have some great, young arms close to reaching the majors. I am excited to see what he has this season and hopefully he'll put up some good numbers and eat up some innings. It's unclear whether he'll start in the Twins rotation, the Twins bullpen, or in Rochester's rotation. A lot will depend on how strong his arm is in Spring Training. Nick Blackburn - He exploded in 2007 to be one of the best pitchers in the Twins organization. After a sub-par career, he won 10 games and compiled a 2.54 ERA in 148.2 innings between New Britain and Rochester. He struggled with the Twins, however in 11.2 innings, he really was shelled in 3 of the innings which made his ERA look horrid. But he did show a bit of promise, however I think he'll need a great Spring Training to crack the rotation. But the Twins may keep him on the roster to help with long-reliever duties and spot-starts. Glen Perkins - Perkins is a hometown favorite, with solid numbers throughout the last 5 seasons, going back all the way to his days at the University of Minnesota. Primarily a starter, he's been used as a middle reliever for the Twins in limited time the past 2 seasons. His major league numbers are great, however the Twins would like to work his arm into the rotation as he possesses middle-of-the-rotation potential. He may open the season in the Twins bullpen, but I hope they start him in Rochester's rotation and work him into the Twins rotation at some point during the season. Brian Duensing - He's the only pitcher on the list that's not on the 40-man roster, which means he's never made a major league appearance. He's a solid pitcher, although he doesn't project more than a back-end starter in a rotation. Of course, I do want to see him pitch before I make a proper assessment on him, as I'm just going off of written reports of him (although I did see him on FSN this season when they had the "Red Wings Rewind" although it was just clips of him pitching). He's got the lowest chance of making the rotation as far as "in-house" options go. So the Twins obviously have options, even if they trade Santana, they'll still have plenty of options to start. The problem is though that the "in-house" options all have very limited experience in the majors and Liriano is the only one who's had any sort of significant Major League success. So this raises the pressure for the Twins to acquire a Major League ready pitcher in a trade that involves Johan Santana. A few pitchers who have been kicked around are the Yankees' Phil Hughes and Ian Kennedy. The Red Sox's Clay Buchholz and Jon Lester. And others such as Brandon Morrow of the Mariners, Jered Weaver of the Angels, and Mike Pelfrey of the Mets. This obviously leaves Nick Blackburn, Glen Perkins and Brian Duensing to compete for a spot in the bullpen, or all could be starting for the Rochester Red Wings. But if I could have my wish (I know, STOP WITH THE SPECULATION), I'd probably lean towards a deal with the Yankees for Phil Hughes, Ian Kennedy and a 2nd-tier prospect. Would they do it? Maybe since they wouldn't be including Melky Cabrera in the deal, but they may be reluctant to include two of their future starters for Santana. With Kevin Slowey potentially taking over for whoever struggles. Have a great day. And in case I don't get to post beforehand, Merry Christmas and Happy Holidays. According to sources, the Mariners and free agent pitcher Carlos Silva agreed to terms on a 4-year deal worth $44 million. Silva was the top pitcher in a weak free agency class, and it's not at all surprising to see him get a 4-year deal, and it's also not surprising to see him get $11 million annually. Pretty good for a pitcher with a career 55-46 record and a 4.31 ERA. Acquired from the Phillies in the Eric Milton trade back in 2004, the "chief" went 47-45 with a 4.42 ERA in 129 games with the Twins. He recorded 306 strikeouts, while only surrendering 112 walks. He has been known around the league to have great control. But has also been known to either pitch lights out, or get shelled. He had a very poor 2006 season, and was demoted to the bullpen at one point. His ERA crept towards 6, and he was allowing batters to hit at a .321 average against him. He definitely settled down in '07, although some have to wonder about his previous seasons. But fortunately for Silva, '06 looks like an outlier of his career numbers. His career numbers (without '06 on his books) are actually pretty good. He has a 3.91 ERA with a 44-31 record. He'll help sure up a mediocre rotation in Seattle. The Mariners will likely come out with a rotation of Felix Hernandez, Silva, and Jarrod Washburn, Miguel Batista and Brandon Morrow. Pretty good with a few up and comers on offense like Adam Jones, Wladimir Balentien and Jeff Clement. The future looks bright in Seattle, although they do need to free up some salary by trading Richie Sexson. I think the club would be best off by trading him for a mid-level prospect, and just letting the new team take on all financial responsibilities. Sounds like something the Yankees could consider. Some may think that the amount of money is ridiculous, which I won't argue, the market for pitching these days is ridiculous and it's probably going to get worse. However, I can justify paying a pitcher from the Major Leagues that kind of money before handing it over to a Japanese pitcher who has never played an inning in the Majors (which they were linked to Hiroki Koruda, who signed with the Dodgers). I'm not saying Japanese pitchers aren't good (except in this case where I think Kuroda's numbers are pedestrian), but Silva has M.L. success, and there have been far too many pitching busts from Japan. Seattle looks to have a solid team as we head into 2008 and the acquisition of Silva is a solid signing, despite the amount of money they signed him for. Make sure to over to Seth Speaks and check out his interview with Pat Neshek. And make sure to check out the comments, where Pat has responded to a few questions from fans. (And if you would like to read another interview with Pat, check out the one he did for this site in July). Silva better take me to Beni's if he goes to Seattle haha, I just want to see him eat again! Pretty comical and I think the Twins will in fact miss him. It's been known that he's best friends with Twins-ace Johan Santana. In fact, Santana was in Silva's wedding party in his wedding a few weeks ago. He was great in the clubhouse and a great competitor on the mound (except when he has a "tummy ache"...KIDDING). And I think the Twins will definitely miss his competitive nature that he brings when he is on the mound. SAFECO Field will likely suit him well, and he has a good infield behind him to help with his sinkerball. I expect him to have a great career in Seattle. In my dreams, what would I do? Good morning. I know most of you are probably sick and tired of reading about speculation of what the team is going to do. But unfortunately, there's not a lot to talk about. I could talk about the Mitchell Report, but I know everyone is sick of that. I could talk about the Santana situation, but again, I know everyone is sick of that. So I don't really have much else to talk about. But if I could fulfill my dream finish to this off-season (without being ridiculously unrealistic), this is what I would do from here on out. But let me first state, this is just all a dream, and I know that it's not all as realistic as I may think. Thoughts: Well, the Cardinals probably wouldn't do this trade, reason being is that Santana will cost too much in terms of money compared to the value of players they are giving up. They would be even more cash strapped than they are now, and they'd leave themselves with a big hole in center field. It'd also take away both of their two top hitting prospects. 1. Kenny Lofton - 1-year $5 million deal. 2. Mark Prior - 1-year $3 million deal, with a vested option that if he pitches X amount of innings, his 2009 option is automatically picked up (worth $6 million). 3. Justin Morneau - 5-year $65 million deal. 4. Michael Cuddyer - 3-year $30 million deal. Lineup/Rotation: Since these moves would moreso affect 2009 instead of 2008, I'll give my lineups/rotations for '09. I know we've all thought about our dream off-seasons, but hopefully this one is a little different than one that you've seen or that you've thought of. What are your thoughts? Do you like it? Do you think it's at all realistic? What is your dream finish to this off season? Hopefully there will be some sort of news that I can dwell on tomorrow. Well, first and foremost I want to apologize for my lack of posting these last few days. I finished up my last final yesterday morning, so I am hoping to be able to post more consistently from here on out. Last week, the Twins signed two former Houston Astros infielders. On Thursday, the Twins added shortstop Adam Everett. Everett is a defensive specialist who doesn't have a great side to his game offensively, but he is considered one of (if not the) best defensive shortstops in the game. Then on Friday, the Twins added corner infielder Mike Lamb, to hopefully become the Twins everyday third baseman. Right now, the Twins depth chart would have every position filled, except for center field, which still doesn't have an "ideal" player. The center fielder also has another choir for the Twins, to bat lead-off. Currently, the Twins don't have a good fit to take over the number one spot in the lineup. There haven't been many thoughts of the Twins adding a center fielder from free agency, but there are a few guys out there who could be good fits. • Kenny Lofton - probably has at least one more "decent" year left in him, and he can still cover the field well despite the fact that he's going to be 41 years old this season. He could be just a one-year signing with an option for '09. • Corey Patterson - he isn't a great fit, but he is younger and could probably offer a little more power. He does concern me as he has just a career .298 on-base percentage, which doesn't seem like an ideal fit for a lead-off hitter. • Scott Podsednik - he has lost a step and he hasn't played much center field since he was with the Brewers in 2004, but nonetheless he is an option for both center field and lead-off. • Reggie Willits - he has a great on-base percentage and he's under team control until 2013, which is definitely appealing. He probably wouldn't cost a lot with the current outfield situation in Los Angeles, but I see the Twins only acquiring Willits if they don't trade Johan Santana, which is probably our most likely of ways of acquiring a center fielder. • Juan Pierre - talk about no power, Pierre has only 12 home runs through 4,778 career at bats. Although, he has stolen 45+ bases in each of his last 7 years. He is likely going to be pushed to the bench after the teams acquisition of Andruw Jones. Pierre could be a low-cost trade possibility. • Randy Winn - the Giants made an interesting move last week as they signed free agent center fielder Aaron Rowand to a 5-year $60 million deal. The reason being is the Giants aren't going anywhere fast. The team also has Nate Schierholtz, who looks ready to take over everyday duties. The team may choose to trade him for some pitching, perhaps Juan Rincon could do the trick, although I don't see any team really wanting him after the fallout with the Twins-Rays trade last month. • Jeremy Reed - another low cost option. He'd likely only require a 3rd-tier prospect, although he himself has gone from prospect to suspect after a few poor seasons in the majors. Although, 775 at bats is not enough to accurately assess his ceiling in the majors. He could be a low-risk/high reward kind of guy, although I'm not sure I feel comfortable with him as our only real option in center. • Austin Kearns - despite what the club may say, I still think that they'd consider trading Austin Kearns if they were given the opportunity. He's not really an ideal lead-off hitter, although he probably would be fine in that role. Jim Bowden will probably want way more than he's worth, so he may not be the best fit for the Twins (They'd probably demand Kevin Slowey and then some, which is way too high of an asking price). • Coco Crisp - and no, I'm not talking about a deal involving Johan Santana. The Red Sox look pretty set to move forward with Jacoby Ellsbury in center field (if they don't acquire Santana) which would push Crisp to the bench. I don't see them pushing him to the bench, which means he'd likely be traded. The Twins could explore a deal with the Red Sox that doesn't involve Santana if they choose to keep him, or if they choose to trade him to a different club. • Willy Taveras/Ryan Spilborghs - both are starter worthy, yet there aren't enough spots in the outfield for both of them. Both could net fairly good returns for the Rockies, and both would fit in the Twins offense for next season. Spilborghs isn't as ideal of a lead-off batter as Taveras is, but he does have a good average and a good on-base percentage which wouldn't make me all that nervous in that role. • Josh Hamilton - he's the feel good story of '06, and he's also a possibility to not be back in Cincinnati. Why? I don't know. The team is in the middle of a rebuilding, or so you'd think, but they've got some pretty high-priced players who should either be traded (Ken Griffey Jr.), or not signed at all (Francisco Cordero), which puts this team in a little bit of a bind. It's no surprise that the Red have a high-number of outfielders which makes one of them likely to be moved, but I don't think Hamilton should. With that said, if he is available, I'd love to see the Twins go after him. He'd probably cost us one of our ML ready pitchers and a mid-level prospect. • David DeJesus - the Royals are also in the middle of a rebuilding, and they too have signed some fairly questionable players (Jose Guillen), however they don't really have a need to move anybody. But they could choose to trade DeJesus for a player who could help in a few years, opposed to holding onto a player who probably doesn't fit into your plans long-term. The biggest problem with DeJesus is that the Royals are in the same division, although he's not a great player, the Twins may be reluctant to trade a prospect for him. Those are just a few options the Twins could pursue. But as of right now, the Twins would likely go into the season with one of Jason Pridie, Craig Monroe, or Denard Span as their starting center fielder, with Pridie or Span leading off (if they won the spot), or if Monroe won the spot, the Twins may be more apt to start Alexi Casilla in order to fill the lead-off role. We'll see, I'm not expecting this spot to be filled until after we learn about Santana's future with the club, which could come sometime in the next week (which some feel it will happen by Christmas). 1) If you missed any of this, I should be having a link to my top 50 on the side column at some point today (hopefully). 2) The Twins signed Adam Everett yesterday. I'm not thrilled with this deal, but he does play some great defense and if we can get another bat or two, I'd be happy with this deal. 3) If you'd like to see the excerpts for some of the former-Twins players mentioned in the Mitchell Report, click here. 4) If you'd like to read a good reaction, check out SethSpeaks.net. He gives his thoughts on the whole Mitchell Report. The Braves seem to be producing young outfielders in their minors at a very high rate, and it's true. According to Baseball America.com, 4 of the top 5 Braves prospects for 2008 are all outfielders. Schafer at #20 probably will surprise some people, but I think that he has a lot of talent. I really like what I've seen from Schafer. He reminds me a lot of Grady Sizemore and I think that's a very good comparison. He plays great defense and he has a good bat and should be able to hit both at the top of the order, or in the middle. His OBP and ability to steal a base make him a threat on the base paths as well. He also has good gap power and should be able to hit about 20 home runs per season while having a .300+ average. He probably will start the 2008 season in Double-A with the Mississippi Braves. Adam Miller has been up and down on my prospect list while I was making it. I had him first slated at #9 but I decided that his stats were just not up to snuff to be worthy of a top 10 candidate, so I pumped him down to #29. Then I thought, well I think that his ceiling is still incredibly high for a late-20's prospect, so I pumped him up and just to keep the train rolling, I moved him to #19. His stats at Triple-A over the last year and a half are far from impressive. But he still projects as a top of the rotation starter or possibly a dominate closer with his mid-90's fastball and great slider. I see Miller as taking over the closer-role for the Indians in 2009 if they find out he can't stay healthy enough for a rotation spot. The Indians could have one of the best bullpens in baseball if Kobayashi and Miller can pitch to their abilities. Miller will likely fight for a roster spot in Spring Training and I think the Indians will keep him on their roster one way or another, whether it's in the bullpen or in the rotation. Carlos Gonzalez has a lot of tools to make him one of the best young outfield prospects in the game. He can hit for both power and average as well as play defense at a very good level. He really needs to work on his plate discipline as he strikes out about 3 times per time he walks. With the amount of young outfielders in the Diamonbacks outfield, unless there is a trade or injury, I expect Gonzalez to spend most of the season in Triple-A and make an appearance during September call-ups. Ellsbury's name should be familiar to readers of this site. His name has come up many times in trade talks with the Twins and Red Sox revolving around Johan Santana. Well, any player who's being considered in the Johan Santana discussions as the centerpiece of the returning deal for the Twins, must be a good player. And indeed is the case with Ellsbury. He's not a great power hitter, although he did hit a few home runs for the Red Sox later in the season, but he does play great defense at a premium position and he also utilizes his speed very well on the base paths to both steal bases and to get on base at a high clip. He projects to be a .300/.380/.400 kind of guy who could steal 30+ bases a season while being mentioned as a gold glove winner. I project him to be on the opening day roster whether it's in Boston or in Minnesota. The Yankees have to be feeling good about their 3 young pitchers. Kennedy projects to be a #2 starter, but he should be a great #3 or 4 starter with Phil Hughes, Joba Chamberlain and Chien-Ming Wang already ahead of him (and Andy Pettitte as well in '08). Kennedy has a low-90's fastball with command of his curve, change-up and slider as well. He's a good control pitcher, but does have the capabilities of striking out a few batters. He probably will be in the Yankees rotation, but could move between rotation and bullpen with Mike Mussina this season. Rick Porcello was rated the #1 high school pitching prospect in the 2007 draft, but due to the fact that he's represented by Scott Boras, he fell all the way to the 27th pick, right into the Tigers lap. He has a mid-90's fastball with a lot of sink to it which will definitely fool batters. He projects as a #1 starter, with 4 pitches. He has a fastball, and is working on his curve, change-up and slider. He'll probably be with the Single-A West Michigan Whitecaps to begin 2008, but could make the jump from Low-A to Double-A if he shows he has the stuff. I see him moving through the system at a fairly high speed. The Mets had three top young outfield prospects, and now are down to two. They chose to trade Lastings Milledge for pretty much nothing, which leaves them now with Carlos Gomez and Fernando Martinez as their future outfielders. Martinez is a very young, raw player but he's also shown that he does have a lot of talent and should become a major league start at some point in his career. Martinez is just 19 and probably will start 2008 in Triple-A with the New Orleans Zephyrs. He should start in Double-A, but the Mets have tendency to rush some of their young prospects. He should be completely healthy this season, after only playing half a year because of a right-hand contusion. He probably won't play center field in the Majors, as he has Carlos Beltran as the starter for the foreseeable future and Carlos Gomez is probably the next best option after Beltran. Martinez could play the corner outfield, but may end up at first base. Wood has been on the very of breaking into the majors for the last two years. His overall numbers aren't overwhelmingly impressive, but his power potential is amazing. If he can ever produce close to where his potential is, he should be racking in (at least) 35-40 home runs per season with about 40 doubles. His OPS should be somewhere around .850. Wood's biggest flaws are that he strikes out a lot and that he does not play good defense. He's been moving back and forth between shortstop and third base, but his defense is just so bad that he may be forced to move to the outfield or become the designated hitter if he should remain with the Angels. He should probably be with the Angels to start the season, the only question is where will he play? Johnny Cueto really made his way through the Reds minor league's in 2007. He started off in Advanced-A with the Sarasota Reds and made his way up to Triple-A with the Louisville Bats. He mixes a mid-90's fastball with a change-up and a hard-breaking slider. I know that my ranking for Cueto may come as a surprise, but I think he has "top-of-the-rotation-starter" written all over him. He'll likely start the 2008 season in Louisville, but he could challenge for a roster spot in Spring Training. Adenhart has been impressive since he was taken with the 413th pick in the 2004 draft. He has won 28 games opposed to just 15 loses and has held his a very strong 3.14 ERA through 361.1 innings. Adenhart mixes a mid-90's fastball with a curve and a circle change which is his strikeout pitch. He had Tommy John surgery after he was drafted and has come back very strong. He'll start the '08 season in Triple-A and with all the options the Angels have at pitcher, unless he really impresses he may have to wait to get his chance at the major leagues until September call-ups. The Reds definitely have some prospects to look forward to, and two of them are projected top-of-the-rotation starters in Cueto and Bailey. Bailey has the potential to be a #1 starter, whereas Cueto projects more as a number two, but nonetheless both will play big roles in Cincinnati as they begin to rebuild their team from within. The Reds will probably turn to the soon-to-be 22-year-old as a starter in '08, and don't be surprised if he puts all his '07 numbers behind him with a great '08 season. Injuries slowed him down in 2007, but he should be ready to go in 2008. He's got the stuff, he just needs to put it out there now. The Pirates must be thrilled with what they saw from McCutchen in '08. His Double-A numbers look bad, but trust me, they were horrid in the beginning of the season before he took off in the second half. He is a five-tool player and could become one of the better defenders in the majors. His size makes him look like he won't have a lot of power, but that hasn't been the case. He reminds me a bit of Torii Hunter, but his offensive potential is definitely greater. He should probably start '08 with the Triple-A Indianapolis Indians. There was little doubt why the Rays took Price with the number one overall pick in last June's draft. He had great success while pitching for Vanderbilt university in the very tough, SEC. He compiled 366 strikeouts in 254 innings of work in his 3-year college career. He also had a great 17-7 record and only allowed 74 walks. He is definitely going to be on the fast-track to the majors and could see time with the Rays at some point this season, which is what Joba Chamberlain did with the Yankees, but that's very rare. I put him at Advanced-A with the Vero Beach Devil Rays to begin the season, but it shouldn't be long before he's starting at Tropicana Field in a Rays uniform. The reluctance of the Red Sox to trade Clay Buchholz in a deal for Johan Santana should speak highly of how they feel about his future. (Just to clarify, they probably would trade him, but he definitely wouldn't be coming with anyone else worth anything) The opportunity for them to part with a young prospect for a two-time Cy Young winner in his prime doesn't usually get passed up too many times. Well, the Red Sox may be making a "gutsy" move by holding onto him, but he definitely deserves the hype that he's received. In his second start with the Red Sox, Buchholz threw a no-hitter and for that, the team has to be feeling that he's going to be a special pitcher. He controls the strike zone very well and with his high-amount of strikeouts, it's amazing that doesn't walk more batters than he does. He'll probably start the season with the Red Sox, but with the options at starting pitcher the Sox have, he may be used as a spot starter for part of the season until a clear spot in the rotation opens. The Cardinals couldn't have picked a better player to replace Jim Edmonds in center field after he's gone. Rasmus is almost a clone of Jim Edmonds on offense and is very close to him during his prime at defense. He has good plate discipline and gets on-base at a high clip. He should be ready for action at some point this season, although he likely won't become a starter until '09. He will start the 2008 season in Triple-A with the Memphis Redbirds. It's not to hard why I chose Kershaw to be the top left-handed pitching prospect in baseball. He posses a lot of talent for just being a 19 year-old. He dominated the Midwest League in '08 and skipped Advanced-A to have some good success in limited time at Double-A. He brings a mid-high 90's fastball (between 96 or 97 MPH) and a great curve with a change up. He should probably start '08 in Double-A, but his talent might be too much to hold him down. I could see him getting some sort of playing time with the Dodgers at September call-ups, but that may be thinking too optimistically for a 20-year-old. The Marlins and Tigers completed the big blockbuster trade during the Winter Meetings in which the Tigers received Miguel Cabrera and Dontrell Willis for 7 young players. The reason this deal got done was because the Marlins knew what kind of player they'd potentially be getting with Cameron. He projects as a middle-of-the-order hitter with a good glove. He reminds me of Grady Sizemore, but I don't doubt that he could some day be a lot better all-around than Sizemore. Cameron should probably start the '08 season in the minors, as he only has 20 AB's after Advanced-A, but with the unlikelihood of the rebuilding Marlins doing anything in 2008, he could be an everyday starter, despite the lack of experience. Joba arrived with the Yankees later last season after starting 15 of 18 games in the minors in just his first season of professional baseball. He became one of the most dominating relievers in the big leagues in his short time with the Yankees as a set-up man for future Hall of Fame closer Mariano Rivera. Now next season, the Yankees are going to put him in their starting rotation to see if he can hopefully dominate as a starter as well. Whether if he's a starter or a reliever, I see Chamberlain having very good success in the majors and the Yankees have to feel good about their future rotation with Phil Hughes, Ian Kennedy and Joba Chamberlian as well as Chien Ming Wang as their top 4 starters. If all the young players can pitch anywhere close to their potential, I see the Yankees being legit contenders for the next decade. Here's a hint: don't trade any of them! (As much as I'd like to get my hands on one of them, I think the Yankees should keep them all intact, they've got something special). Chamberlain should be in the Yankees rotation in '08, but if he should struggle the Yankees will likely put him back into the bullpen where he's already had success. Well, there have been many Tampa Bay prospects on this list (5) and Longoria is bar-none the best of them all. After being drafted with the third pick in the 2006 draft, Longoria made it all the way up to Double-A in just his first season of professional baseball. He's possessed good plate discipline and he can hit for both power and average. He is a good defender at the "hot corner" which should give Ray fans optimism as they look forward to their up and coming prospects (especially the pitchers) over the next few years. Longoria probably would be best off by starting the '08 season in Triple-A with the Durham Bulls, but it shouldn't be long before the Rays have him in their starting lineup. There's very little doubt why Bruce is my Top Prospect heading into the 2008 season. He's a five-tool player and shows the capabilities to hit for both extremely good power and a very good average. 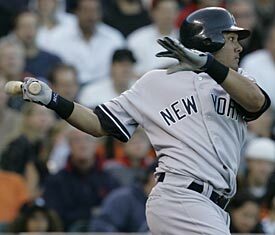 Lets just say, he can flat out hit. Bruce shows better plate discipline than most of the other batters on this list, but it's still something he'll work on as he learns the majors. He doesn't have elite speed, and will probably switch from center field to right field at some point in the not-so distant future, but he's the reason why many feel the Reds have to be feeling good about the next five to ten years. Bruce will probably be starting this season as the Reds center fielder, but when Ken Griffey Jr. is gone, he'll probably move to right field. What do you think? Anyone you would've listed higher? Lower? Who do you disagree with? Who do you agree with?